Haide posted her first blog entry last June 28 with “Paghimugso,” and has, since then, written about every race that she’s joined (plenty). In her commentary, Haide is candid (calling the other weekend’s run, “The Great Lapu-Lapu Run Race Review Part 2: Great Expectations, Great Disappointment”). She is comprehensive and thorough. She writes on a personal, first-person level—what she sees, likes, suggests, criticizes—she pours out. I like it. Click on Marathon Foodie here. Thank you so much for the feature. Just the idea of you reading what I write is such an honor. A year ago I never thought I would make it to the sports pages. Now I’m on your column! I’m so positively thrilled. I’m an old friend of Haide’s and have been following her blogs on her marathon stories. They are quite inspiring and knowing how Haide has remained modest about herself throughout the years (after so much accomplishments in her life – yup, she’s also a superstar amongst her old friends! ), she remains to be an inspiration to people who know her – her persistence and determination just simply emanates in the things that she does. Go, Haide! Hi Haide! 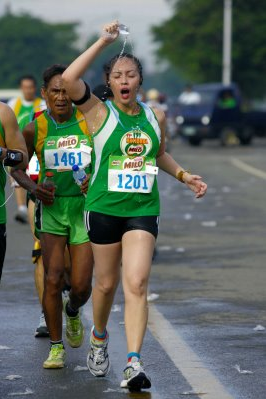 Thanks a lot… I foresee your blog to be the main site for all runners in Cebu. Keep up the good writing and see you on the road soon (this Sunday?). God speed! Inez… very, very well said. Thanks!